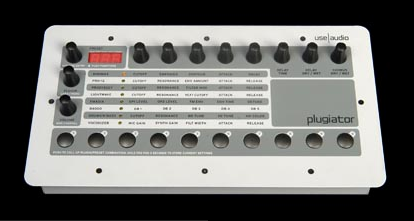 the big thing on this little box is: you can get it to run the modular III synth also, so it could be nice for former clavia NordMicromodular, MicroModular users? EDIT: 11/2010 – this synth is out of production now. This one seems not to come from Soniccore but from the inDSP indian company. It is open/modular so you upload the software and it is one of the Klangboxes or other Plugins of the System..
It’s a chinese company – never heard of them before but they offer some modules for the CME keyboards, too. there’s 4 synth in the box: minimoog (minimax),lightwave (simplified microwave), the B4000 organ and a vocoder (vocodizer). you may know, that soniccore is the official successor of creamware, so they might sell it all as a sub-license manufacturer called use-audio. including the modular III! and all ASBs, so here it is – the new small modular after clavias modular..